Mathematics is one of the oldest and most fundamental sciences and can provide you with a wide variety of careers including technology, liberal arts, business, education, science and engineering. If proofs, equations and challenging problems get your heart rate up, majoring in mathematics may be right up your alley. Math majors take courses in calculus all the way up through differential equations and are fully prepared to transfer to a four-year university with the required courses. Our small class sizes and dedicated faculty provide you the platform to succeed with your long-term goals. We designed the curriculum in a way that allows you to seamlessly transfer to a four-year institution and complete your baccalaureate. We designed the curriculum in a way that allows you to seamlessly transfer to a four-year institution and complete your baccalaureate. 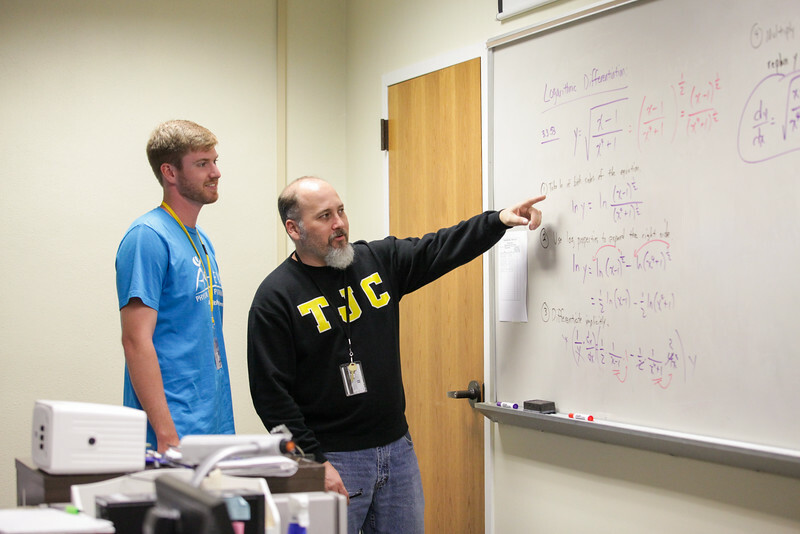 The George Tefteller Mathematics Annual Scholarship was established by the Tyler Junior College mathematics faculty to honor and commemorate Mr. Tefteller’s long-time service to TJC. Tefteller served as a mathematics professor at TJC for 50 years. His devotion to the field of mathematics and his passion for helping students was obvious to those around him. Words used by fellow faculty members to describe Tefteller include intelligent, patient, consistent, thorough, dependable, trustworthy, committed, enduring and the quintessential professional. The George Tefteller Mathematics Annual Scholarship in the amount of $500 will be awarded to a worthy student for the spring 2018 semester. The recipient may receive an additional $500 for the fall 2018 semester if criteria are maintained. Interested individuals should submit a complete application to the Office of the Dean of Engineering, Mathematics, and Sciences, in Jenkins 155 no later than November 10, 2017. With our Physics AS, you can move forward in your career and develop new technologies, methods, and theories based on the results of research to contribute to innovative, real-world applications.